We’ve spoken a lot about the dangers of wandering and elopement in our loved ones with autism. 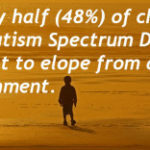 And yet with statistics showing that roughly half (48%) of children with Autism Spectrum Disorder attempt to elope from a safe environment, it’s a subject that really can’t be talked about enough. Recently the parents of two autistic boys (10 and 8 years old) on Long Island won the right for their kids to wear GPS tracking devices to class.